Favorite Credits: Directed many student productions at St. John's. Also an actor, choreographer, sketch comedy writer and improviser. Former character performer at Disney World. Why theater? : I love theatre because it is inherently collaborative. You literally cannot do theatre with just one person. I also love the imperfect nature of it – there is no post-production editing or “take twos”… everything you do onstage at every moment is right. You have to believe in it, and you always have to support those around you. Doing theatre teaches us how to live. Tell us about Grimm: GRIMM is a haunting new musical that tells the story of twin sisters and rivals Catherine and Angelica, who are vying for the crown in a powerful tale of good and evil. GRIMM features familiar characters created by the Brothers Grimm, from Hansel and Gretel to the wily Rumplestiltskin, entwined with a ghostly ensemble that spin chilling new twists on fairy-tale classics. What inspired you to direct Grimm? 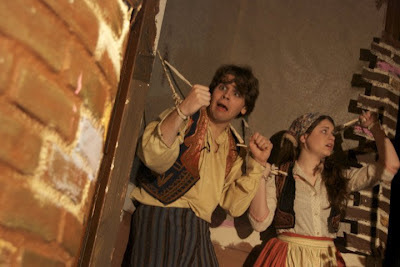 : The show was written and created by two of my best friends – Ken Kruper and Jon Randhawa – and we originally produced it at St. John’s University in 2009 as our children’s theatre project. I was in the cast of the first production, and I fell in love with the story and the score. When we had the idea to submit it to Fringe and actually got accepted, I immediately jumped at the chance to lead the creative team in growing and re-imagining the piece. What kind of theater speaks to you? What or who inspires you as an artist? : I am inspired by pretending and play. Even something as simple as two business professionals who are forced to create pretend dialogue together during an icebreaker activity at a company retreat – I am always inspired by people playing together. I also love dance and improv. In terms of my growth as an artist, I am moved by the thoughts, writings and creations of Anne Bogart, Robert Wilson and Fred Newman. Their work has pushed me to see theatre and life in a completely new way, and given me the courage to challenge every convention I know. If you could work with anyone you’ve yet to work with, who would it be? : This list could go on forever, but I think Robert Wilson would be at the top. I’d love to spend a season at Watermill. What show have you recommended to your friends? : Avenue Q. Always. Who would play you in a movie about yourself and what would it be called? : Delta Burke? Is she still alive? And I have this idea for a book called “Never a Bridesmaid, Never a Bride”. That seems like a good title. What’s your biggest guilty pleasure? : Pop music. I love Britney and Ke$ha. If you weren’t working in theater, you would be _____? : Taking a lot of classes. What’s up next? : Well, BIG Theatre Company has started working on creating what we hope to be our next production, America: The Musical. We are also rolling around a few other ideas, but we’re just eager to work together again. We love making theatre.